Mollywood is all set for the big Ramzan release season and it will be a tough competition for all the films which is going to hit the screens from July third week. The previous season for Mollywood was the summer vacation season and it had bought a great run for Mollywood box office with as many 5 super hit films in which one has become one of the all-time blockbusters. Ennum eppozhum starred Mohanlal, Chandrettan Evideya starring Dileep are the hits of the season and Bhaskar The Rascal starred Mammootty was the mega hit. 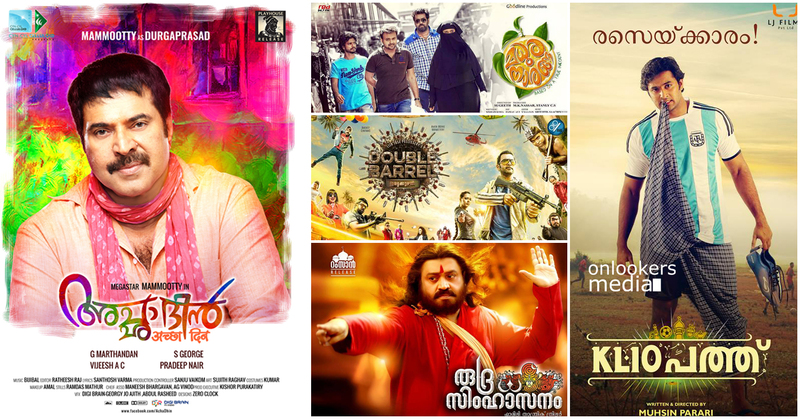 Nivin Pauly’s Oru Vadakkan Selfie and Premam becomes the Blockbusters of the season as well. Now the Ramzan releases gearing up for the release and this time the biggest crowd puller of Mollywood Mohanlal’s film and the young sensation Nivin Pauly’s films are absent from the Ramzan race. But we have Mega star Mammootty, Prithviraj, Suresh Gopi, Unni Mukundan, Kunchacko Boban etc are coming this time for the big fight at box office. Dileep’s fil also said to be on this season but it was not yet declared whether it will come at ramzan or not. Mammootty’s film is Acha Din directed by G.Marthandan after his debut film Daivathinte Swantham Cleetus which also had Mammootty in the lead. Another big film is by Lijo Jose Pellissery starring Prithviraj, Indrajith, Asif Ali, Isha Shrvani, Chemban Vinod, Arya and Sunny Wayne and the name of the flick is Double Barrel. Unni Mukundan is coming up with a film titled KL 10 Pathu, directed by debutant Muhsin Parari which was financed by LJ films. Kunchacko Boban-Biju Menon team uniting once again for Sugeeth’s Madura Naranga which will be one of the main attractions of this season. Dileep starrer Love 24×7 may come this season which is directed by debutant director Sreebala k menon. Action king Suresh Gopi this time coming with a horror thriller named Rudra Simhasanam which was written by Sunil Parameshwaran after Anantha Bhadram. This time Ramzan season is quite big for Mollywood as it has almost half a dozen release and the success rate also have to be big. Otherwise it may well be pave way for another crisis in the industry just before onam season.